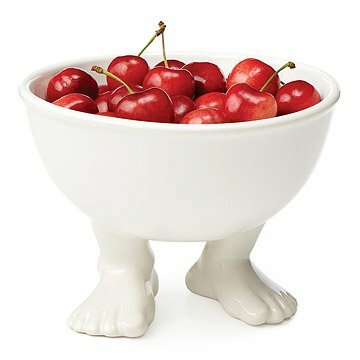 This adorable footed bowl brings imagination and entertainment to the table. Dylan Kendall gives her stoneware a leg (or two) to stand on! In her broad-bellied pieces, whimsical design meets clean-lined minimalism to remind us that play is not just for kids. The tummy of her generous bowl is perfect for holding your morning cereal, pasta or soup. This adorable anthropomorphic piece brings imagination and entertainment to the table. Designed by Dylan Kendall in Los Angeles, California. Made in China. Dylan Kendall is the Founder and Director of Dylan Kendall Home. Dylan believes that fun and functional go hand in hand and that our homes should make us happy. Her designs marry light-hearted whimsy with clean-lined minimalism, creating distinctive objects that bring playfulness and joy into the home. Prior to founding Dylan Kendall Home, Dylan spent a decade in public service. She lead several initiatives that branded her a force in using the arts to create change in the lives of others including founding the nationally-recognized agency: Hollywood Arts, an educational facility that used arts and music to reach homeless young adults. Visit our blog to learn more about Dylan and her designs. Grandson will eat only from this bowl now. I bought this for my Daughter-in-law for Mother's Day and gave it to her early because they were visiting. My 2 year old grandson immediately claimed the bowl as "his" and liked it very much! Possibly the cutest serving bowl EVER! I bought this as a gift for my best friend's mom....I LOVED its whimsical look so much, I ordered one for myself. I keep it on display on my kitchen counter top filled with individually wrapped caramels. It's the perfect size to hold candy or a hearty soup. I might just start collecting one at a time until I have enough to serve 6 friends (I'm thinking Pho!!) If you're looking for something different, unique and worthy of a conversation starter--buy this bowl. I even treated myself to the footed salt and pepper shakers!! This was a gift to my granddaughter. She seemed thrilled to receive it, but I can't tell as yet just how she will use it. Great quirky gift for someone in need of cool kitchen items! Some have complained that this piece is smaller than they'd like, but the dimesions are clearly shown in the description. I bought it for a friend who likes unusual/whimsical things and she told me it makes everyone smile who sees it. Because of that, she keeps it in a very visible place with candy or snacks in it so it has a reason to be out on display all the time. Cute for fruits, entertaining, or even plain ol' cereal or soup. Such a cute bowl. We gave this to another couple that we frequently entertain with and they loved the quirky style of bowl. They could not wait for the next event to show it off. Great product for serving or just normal use of a bowl. I love these bowls! They'd be great for cereal or soup, but I usually use them for serving dips or olives at parties. They always earn smiles and comments. I also have the mugs. I love the levity these bowls add to any occasion. I'd worried that they wouldn't be stable enough, but after many events, I can say they stand up well!